Al Gore at SXSW: We Need to "Punish Climate-Change Deniers" and "Put a Price on Carbon"
The South by Southwest (SXSW) Festival is happening now in Austin, Texas. Running from March 9 to 22, it's a massive film, interactive and music festival that is nearly 20 years old. The festival brings together designers, developers, investors, entrepreneurs and politicians for panels and discussions about technology and innovation. For the third time in the last few years, Al Gore, founder and chairman of the Climate Reality Project, spoke at the festival on Friday. Naturally, his interactive discussion focused on addressing the climate crisis. The former vice president focused on the need to "punish climate-change deniers, saying politicians should pay a price for rejecting 'accepted science,'" said the Chicago Tribune. Gore said forward-thinking investors are moving away from companies that invest in fossil fuels and towards companies investing in renewable energy. "We need to put a price on carbon to accelerate these market trends," Gore told the Chicago Tribune, referring to a proposed federal cap-and-trade system that would penalize companies that exceeded their carbon-emission limits. "And in order to do that, we need to put a price on denial in politics." He called on the tech-minded SXSW crowd, which is dominated by Millenials, to harness technology to launch a grassroots movement to tackle climate change and call out climate deniers. 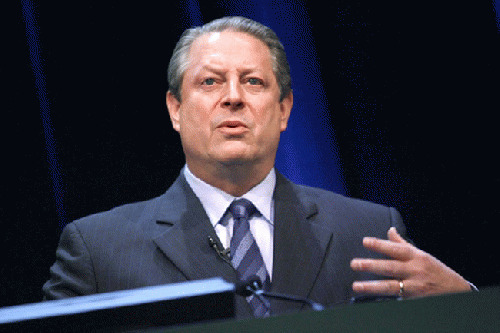 "We have this denial industry cranked up constantly," Gore said. "In addition to 99 percent of the scientists and all the professional scientific organizations, now Mother Nature is weighing in." Years from now, Gore said the next generation will look back at us and ask: "How did you change?" according to Macworld. "Part of the answer may well be that a group of people came to South by Southwest in Austin, Texas in 2015 and helped to make a revolution," Gore said. Gore wanted these young, tech-savvy attendees to start a grassroots movement using social media like they did when "net neutrality was threatened or when the Stop Online Piracy Act threatened to blacklist websites that offered so-called illegal content," said Macworld. That means signing petitions to fight climate change, utilizing social media to call out climate deniers in Congress and streaming the Live Earth Road to Paris concert on June 18, an event designed to draw attention to the climate talks in Paris this December. The former Veep even gave a nod to Pope Francis during his talk, showing a slide of the pontiff and saying "How about this Pope?" Pope Francis celebrated his two-year anniversary as Pope on Friday, riding a wave of popularity "that has reinvigorated the Catholic Church in ways not seen since the days of St. John Paul II," said the Chicago Tribune. Gore said he was looking forward to the Pope's highly anticipated encyclical on the environment which is due to be released in June or July. "I'm not a Catholic," Gore said, "but I could be persuaded to become one."